Amadeus has in the past been low key in presenting itself. But times are changing. It is keen to be seen and heard telling the world what it is all about. And what it is all about can be summed up very easily. It is the world’s largest aviation technology supplier. Essentially a global distribution system (GDS), but now with a host of peripheral activities, Amadeus was established in 1987 as a partnership between Air France, Iberia, Lufthansa and SAS. A public offering was made in October 1999, with the company becoming listed on the Paris, Frankfurt and Madrid stock exchanges. Progressively and in line with industry evolution, Amadeus has diversified its operations by focusing on information technologies to deliver services spanning beyond sales and reservation functionalities, centred on streamlining the operational and distribution requirements of its customer base. Amadeus is big, with a 2017 turnover of €4.852bn. It has more than 17,000 employees made up of 146 nationalities and in 2017 processed more than 630m bookings, representing 1.6bn passenger boardings. According to Forbes magazine, it is one of the world’s top 10 software companies. Introduced by director of group communications Ben Hunt, the Amadeus Media Day was an intense 6hr of presentations covering the whole spectrum of airline data incorporation and financial integration. The term NDC (New Distribution Capability) was introduced, one of many acronyms coming into the industry. The Amadeus Travel Platform is the core of the investment programme. It fell to Fredrik Odeen, a 10-year Amadeus veteran, to explain how he and his team work hand in hand with operators and travel sellers to ensure smooth integration. Based on fully open systems that harness the intelligent use of data, as a one-stop shop it brings together all relevant travel content – including air, accommodation, train, car hire, insurance and destination – from any source (be it the United Nations-sponsored EDIFACT, GDS, NDC and API) into a single platform. 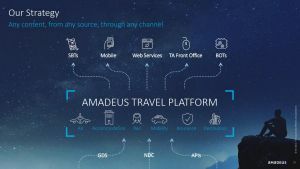 Putting it another way Amadeus works for 770 airlines, 128 airport operators, 112 ground handlers, 300-plus hotel chains, 90 rail operators, 45 car rental companies, 29 insurance provider groups and 54 cruise and ferry lines. The concept is simple. Access to the broadest range of global travel content, all in one place. With the travel platform, it is able to accommodate different business models, giving flexibility and autonomy over how content is sourced, managed and displayed. The content can be displayed through multiple channels and touchpoints such as self-booking tools, web services, travel agency front office solutions and mobile. The appointment of Stefan Ropers to lead its Strategic Growth Businesses (effective 1 February) is a clear indication of Amadeus forward thinking. Ropers is an industry heavyweight most recently head of Adobe in central Europe with two periods at Microsoft, first as global head of Server and Cloud Sales, based in Redmond (USA), and then later as COO and CMO Central & Eastern Europe, based in Munich. 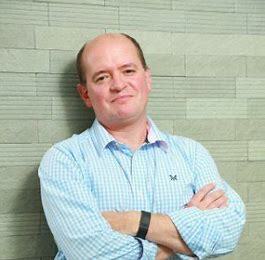 As part of his new role, Ropers will also take on responsibility for Amadeus' Innovation function. Amadeus will again have a prominent presence at the Business Travel Show (Olympia London 20-21 February 2019), where the company will be demonstrating the latest version of its integrated trip booking and expense solution, Amadeus Cytric Travel & Expense. Also being showcased will be a solution to trip planning management as part of the everyday work environment and its integration with Microsoft Outlook and Salesforce. This world map offers a graphic indication of the magnitude of Amadeus, showing the key sites and research locations.